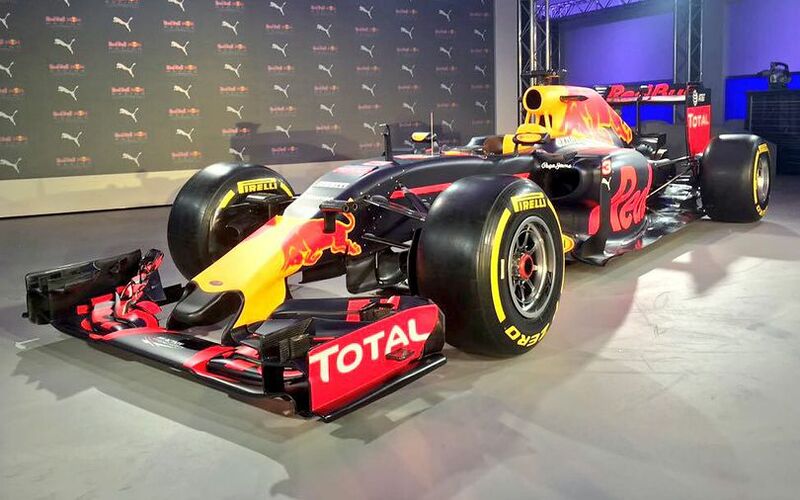 Red Bull revealed this evening their 2016 livery at a team presentation in London. It used its 2015 contender, the RB11, as means to present the livery. The livery does not differ too much from last year, but has some significant differences at the same time. Being stripped from the Infiniti sponsorship, which went to the 2016 Renault works team, the team removed the Infiniti logo's and purple accents on the sidepods. Instead, the Red Bull brand name features prominently on that spot in the typical red colour. Next to the removal of the purple Infiniti colors, the car's general livery remained similar to last year, with yellow accents on the roll hoop and nose, and red Total accents on the front and rear endplates, as well as the typical bull on the side of the roll hoop. The darker blue overall color has been replaced by a matte black one. With this, it follows the several other teams who use the black paint much more prominently, which saves weight compared to more colored paint. Red Bull put special emphasis on their recently new sponsor and footwear supplier Puma. The event was for that reason dubbed by the hashtag FasterTogether on twitter. During the show, all the presentators wore Puma shoes. The logo is also featured on the car on the sidepod turning vane. Finally, TAG Heuer gets a very symbolic place on the car, having its name put on the back of the engine cover. “Seeing our new livery for this year alongside our new team wear from PUMA was a proud moment for us", said Red Bull Racing Team Principal, Christian Horner.